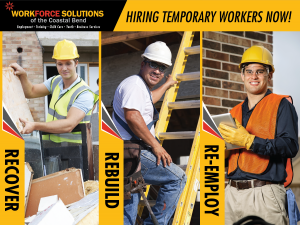 Workforce Solutions of the Coastal Bend (WFSCB) is assisting workers displaced as a result of the disaster through mobile workforce units, employer assistance, and partnering with community-based organizations to provide relief workers. A $1.6 million National Dislocated Worker Grant for the Coastal Bend region has been implemented to create relief jobs for eligible individuals to assist with cleanup, recovery and humanitarian efforts in areas impacted by extensive damage and flooding due to Hurricane Harvey. WFSCB is currently working with local government entities and county officials, school districts and community-based organizations to develop potential worksites to support recovery and rebuilding efforts. If you are looking for work or in need of workers today, please contact Shelby Simms at 361-500-8469 or Shelby.simms@workforcesolutionscb.org. The Disaster Relief Employment Assistance Mobile Units are delivering much needed workforce services throughout the Coastal Bend to cities and counties impacted by Hurricane Harvey. Download the May Disaster Relief Employment Assistance Mobile Unit Schedule Here.